A month or so ago, I attended a one-day symposium, ‘The Power of the Real’ at the Millenium Gallery in Sheffield. The symposium was part of a project exploring the role of objects in design teaching (amongst other things) and the project staff had carried focus groups around some key topics. As part of the day there was a hands-on interlude where we moved around 4 tables each with an object-based activity. The most popular activity involved 4 teapots, each with some water in, that participants were allowed to pour into cups. The activity was very simple but we learnt a lot through this everyday action. The 4 teapots were: a traditional, ‘Brown Betty’, ceramic teapot; an Edwardian, metal teapot which was oval in shape rather than round; a contemporary but nonetheless conventionally round metal teapot; a contemporary craft teapot. I need to describe this last teapot as I don’t have any photos… Imagine that the body of the teapot is made of very shiny stainless steel and has the shape of an upside-down teardrop, the body is held between 2 oversized, metal chopsticks in a contrasting dark, matt brown which are joined at the top. The teapot sits on the triangle of points created by the tips of the chopsticks and the tip of the teardrop. In theory the user is meant to pour liquid out by grasping the chopsticks at the top, where they meet, and rotating the body whilst keeping the feet of the chopsticks on the table. I say ‘in theory’ because it didn’t work: the water didn’t pour well into the cup. Instead I was forced to pick up the entire ensemble holding the chopsticks by the top and base and rotate the whole thing in the air. There was an awkwardness to this as I was crossing my arms over whilst supporting the teapot’s weight. It felt as though I needed to twist my torso in order to do this. Through these teapots, I was reminded of a quote where an author (I can’t find the source) whilst commenting on the design of an art deco, cubish teapot, noted that the origins of the word ‘handsome’ lie in the feeling of rightness when an object sits well in the hand. The art deco teapot was not, in this regard, handsome and neither was the contemporary teapot that I had to wrestle with. This idea of handsome-ness helps to unpick another aspect of kinaesthetic intelligence and this is important because the metaphorical drift in the term ‘intelligence’ is powerfully misleading. Instead what is really being discussed are issue of physiognomy and… comfort. Take, for example, two tea bowls… I say teabowls, I’ve never drunk tea from them only espresso. So… take these 2 espresso cups. They were bought as a contrasting pair. 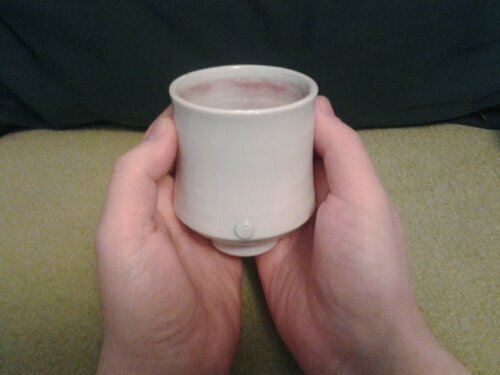 The first is my favourite, my fingers wrap comfortably around the body of the cup, the curve of the body fits nicely into the curve of my hand, the width of the opening makes it easy to drink from. 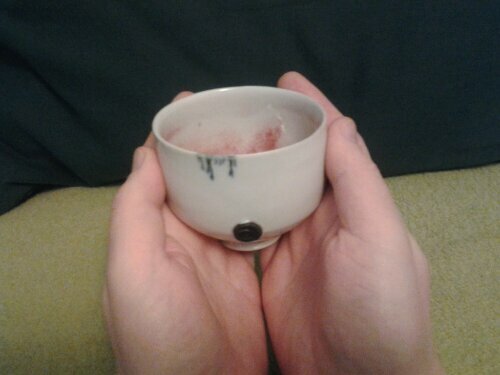 The second has hardly ever been used; the line where the surface changes from concave to convex is hard and presses uncomfortably into my palm, the shape requires me to hold my wrists differently whilst the smaller opening means that the cup rubs up against my nose as I try to knock back the last, evil dregs of my double-espresso. This is erring towards pop-ergonomics, and that feels like a disciplinary digression too far, but it is also about the relationship between the cups and my body. Another author commented on the relative immutability of domestic, craft objects (amphora, urns, bowls, flasks and the like) because their dimensions relate to the dimensions of the human body and the capacity of these vessels is linked to the human capacity to carry them. This source implied a relative stability to the human form and the whole idea has a sort of mythic appeal. However, a conversation with my colleague, Myra, brought this into question. She pointed out that the body does vary over time (on the evolutionary timescale) and with geographocal location. (Apparently there are equations which describe this and that offers out the possibility that you could create graph of the variety of the human body and relate this to variation in the dimensions of domestic objects.) Myra also reminded me that our bodies change over time. This takes me back to Caroline Walker Bynum’s comment that we carry our stories in our bodies. Even in adulthood our musculature changes with use and through accident which, perhaps, changes our relationship to the objects we hold. What is my point? (To be honest, I’m not sure I’ve got one, I’m just thinking aloud.) I suppose the point is that we feel objects with our whole bodies, even if that feeling is mediated by our brains, and that this feeling is about the dimensions of the object relative to our bodies. This relationship is subject both to continuity and change such that a once-familiar object may no longer feel familiar later in life. In the same way that the haunts of our childhood seem so much smaller in adulthood, perhaps the objects of our adulthood will no longer feel as comfortable in our old age…? What would that experience do for us? This entry was posted in Objects, Perception, touch, Uncategorized. Bookmark the permalink.